Make your reservations early, as there is not a wide range of hotel options within easy driving distance of downtown Hook Island. The closest Wotif-listed hotel is the Whitsunday On The Beach, Queensland, which is 25 kilometres from downtown Hook Island. Also, try the One&Only Hayman Island, located in Queensland, which is 8 kilometres away. The Colonial Court Holiday Apartments can be found 25 kilometres from the middle of Hook Island. Alternatively, the One Oceanview is located 25 kilometres away. 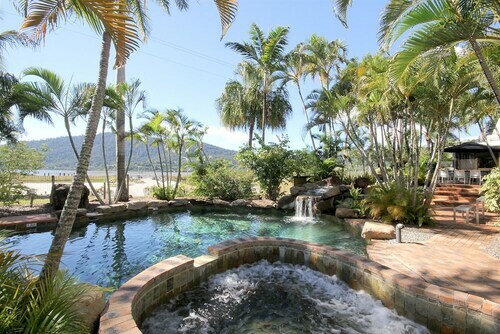 Other hotels on Wotif include the Airlie Waterfront Bed & Breakfast and the Fusion Airlie Beach. 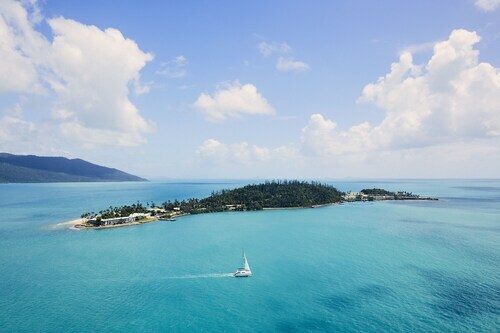 You'd be mental to leave Hook Island without checking out all that Whitsunday Coast has to offer visitors. Whether it's exploring the sights, trying your hand at hiking, or just losing yourself amid Whitsunday Coast's beaches, rainforest, streams and mountains, you'll find your perfect hotel with Wotif. Don't skedaddle before you have checked out the Hamilton Island Golf Club, Catseye Beach and Hamilton Island Marina in Hamilton Island. If you'd like to spend a night or two in Hamilton Island, be sure to check out the Palm Bungalows and Reef View Hotel. Or, you could stay in Long Island, 30 kilometres to the south of Hook Island, where you'll find the Paradise Bay Island Resort and Palm Bay Resort. While in Long Island, set aside some time to check out the Palm Bay and Pelican Island. Situated 25 kilometres from Hook Island is Great Barrier Reef Airport. Stay nearby at the Palm Bungalows or the Reef View Hotel. How Much is a Hotel Room in Hook Island? Hotels in Hook Island start at AU$205 per night. Prices and availability subject to change. Additional terms may apply. Overall lovely facilities and private amenities. Breakfast was an easy enjoyable process. I’m a positive person so I will start there. The location and pool was fantastic. The negatives - on arrival for our 2pm check in our room was not ready until close to 6pm. This meant with no luggage or towels we had to sit in the lobby with an exhausted 2 and 5 year old. I mentioned several times during this period I was unhappy and frustrated as my little boy needed a sleep to no avail except we will give you $100 voucher. I advised I need the room not money and could not be given a time that the room would be ready! I eventually went to the counter and advised I would not be paying for the nights accomodation at all and requested ferry timetable to Hamilton to leave and go there. They than advised me room ready with bags in it and $150 credit. I advised our first day ruined and would not be paying for it and this was agreed. Went to room and one bag missing had to collect from reception. Found room dirty with hair in shower. Seafood buffet nice but no cream for desserts as informed it’s for pancakes tomorrow. Also no ice cream or children’s desserts. Also ate at every restaurant, was told no sav Blanc on island, staff could not take payment was made to wait 15min at ink stone bar, at infinity restaurant was told my party of 11 had to decide there meals that morning and was left wandering around island at 10am getting meal orders! Go to dinner, meal serve shocking and forget my meal so I eat alone after being there for 2 hrs! 30min checkout fighting for promised credit.